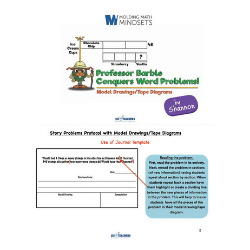 This digital download includes a list of the different types of model drawings that kids would experience and the kind of story problems by grade, a page with all of the codes and what they mean and an example of a problem that would go with each code, the step-by-step model drawing checklist that we use, and a fill-in journal that can go into a journal with the problem and the code. It is formatted so that teachers can create a half-page flipbook as a tool to help them in the classroom. Directions: Print in color on card stock, laminate if desired, cut cards apart, and bind on a ring for easy reference. Read more about model drawing and coding problems for student success in this blog post Coding Story Problems for Student Success: Why and How. Note: Purchase of this product entitles use by ONE teacher in his or her classroom.